Telegraph Street is the main commercial strip abutting the UC Berkeley campus with lots of Korean, Japanese, Chinese and fusion joints catering to UC Berkeley’s students. I expected that this would be a good restaurant row to spend an afternoon eating dumplings but I was a little bit disappointed. 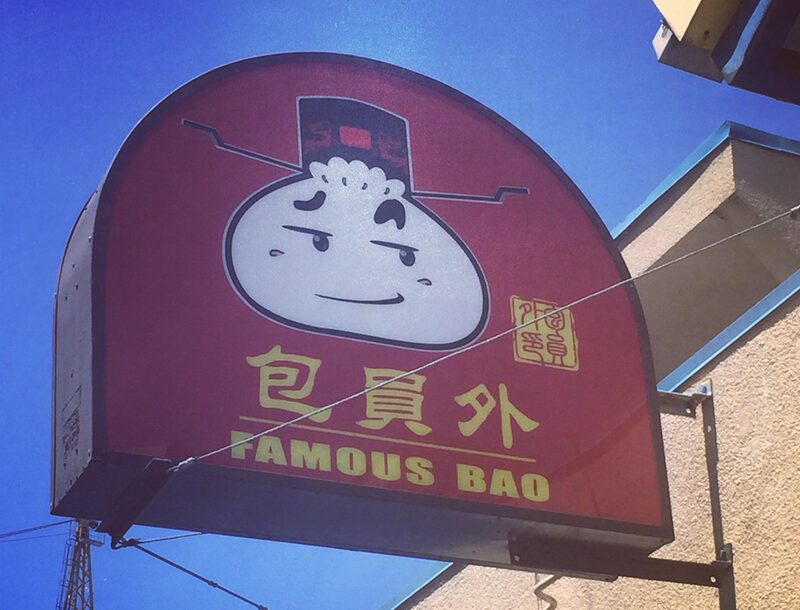 Despite its name, everyone at Famous Bao was eating bubbling cauldron hot-pot dishes, not a single diner had a steamer of buns in front of them. The menu only lists two types of bao; Juicy Pork and Cabbage Bao and Pork and Mushroom Shrimp Bao, and the day I was there they only had the Pork and Cabbage variety. They also have a selection of Xi’an hand pulled noodle dishes and chopped seasoned lamb or pork “burger” sandwiches that are becoming popular in New York City. 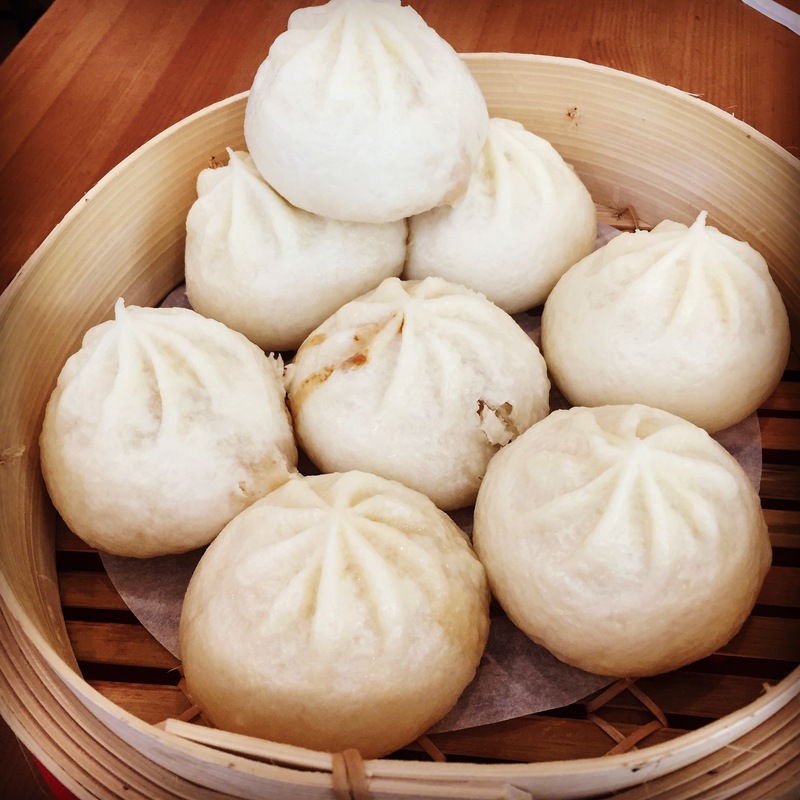 The Bao come eight to an order and are really big, to the point where the steamers they use are not large enough to hold all eight in one layer, so the bao are cooked piled up in the steamer. The bao lacked the promised juice but were really tasty. The bun bread was slightly sweet and the pork was well seasoned and savory. The cabbage actually also contributed to the filling, I could taste the slightly cruciferous flavor and it was roughly chopped so that it added texture and crunch to the filling. I guess the hot-pot dishes must be really something special to have drawn the rest of the diners away from what were really good bao. Dumpling Express sounds like it belongs in an outdated airport food court, but has some really interesting things going on. 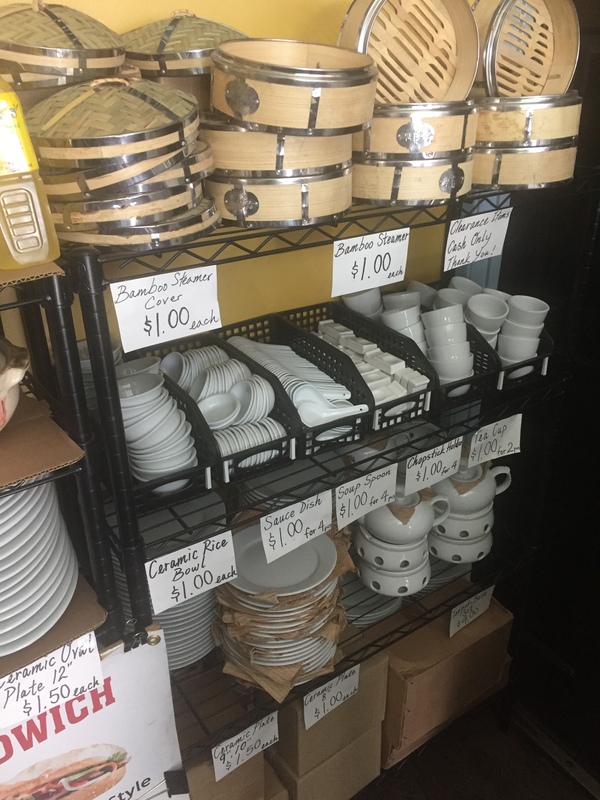 The place is small and has a narrow counter that can seat about 8-10 people, and has weirdly devoted precious space to stocking and selling plates, bowls, tea cups, chop-sticks and soup spoons. Behind the counter there was a woman hand rolling dough and stuffing and pleating dumplings lightening fast. Orders were flying out of the kitchen to a continuously refreshing pool of people milling around in the entryway hoping that their order number would be called just as room opened up at the counter. But it seems that if you are lucky enough to get a seat at the counter its OK to linger and check Facebook on your phone, no one vacated their precious counter spot while I was there. Dumpling Express has a large selection of dumplings, most of which come 12 to an order and since I hadn’t yet walked off the bao and was pretty full, I chose the fried pork dumplings which are 6 to an order. This was a big mistake, as the order I got were over deep-fried into crunchy nuggets of flavorless-ness, even with sauce I could only bring myself to eat two of them. Everyone else was slurpy down plates of boiled or steamed dumplings that looked really good. The choices are: Shanghai Soup Dumplings with Pork or Pork and Crab; Pork or Chicken Dumplings with Napa Cabbage; Fried Pork or Chicken Dumplings; Pork Dumplings with Kim Chi “Spicy”; Chicken Dumplings with Corn; Beef Dumplings with Celery; Lamb Dumplings with Vegetables; and Shrimp Dumplings with Chives. I chose badly, don’t make the same mistake I did. Off of Durant Street there is partially covered alley/cul de sac food court that among others, is home to small Thai, Vietnamese, Korean, Japanese and Chinese restaurants. Each has seating for maybe 10 or 12 people, with additional picnic style tables in the alley. I was still feeling the bao when I found this nook of restaurants and couldn’t bring myself to order any more dumplings. Next time I am in town I will definitely try the steamed dim sum dumplings at Mandarin House, its the Chinese restaurant that has made the design choice of using 8 1/2 by 11 photos of the food to cover every inch of the exterior and interior. Also on Durant there is a Korean restaurant and a Chinese restaurant on the second floor, above the Korean place. While every other place I saw was packed with Asian students, both of these restaurants were empty and looked sketchy. To summarize: 1) do not get loaded down with bao at Famous Bao, pace yourself and take leftovers home or bring a friend or two to share an order, 2) do not order the fried dumplings at Dumpling Express, get the boiled ones, they are what everyone else is eating there; and 3) check out the Chinese restaurant in the alleyway off Durant. 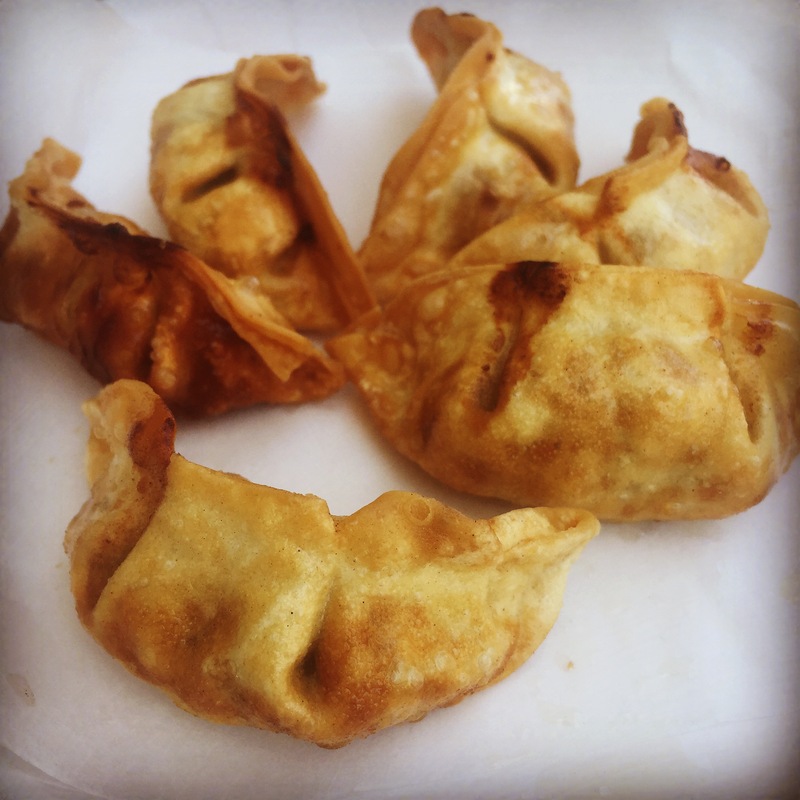 This entry was posted in Buns, Pork, Potsticker, San Francisco. Bookmark the permalink.